Consolidating an array of offices into a single building was not going to hinder Partners from celebrating the diversity of Greater Boston. 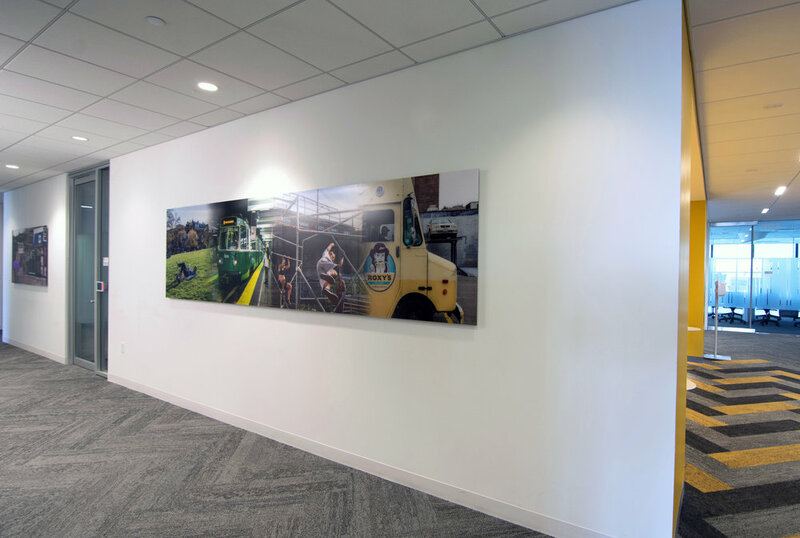 For every-other floor, the consultant commissioned a professional photographer to create large photographic collages of images that make up the fabric of these areas. Covering an average of 15 miles a day on foot, the photographer quietly explored local streets, parks, festivals, and backyards during a number of weeks. 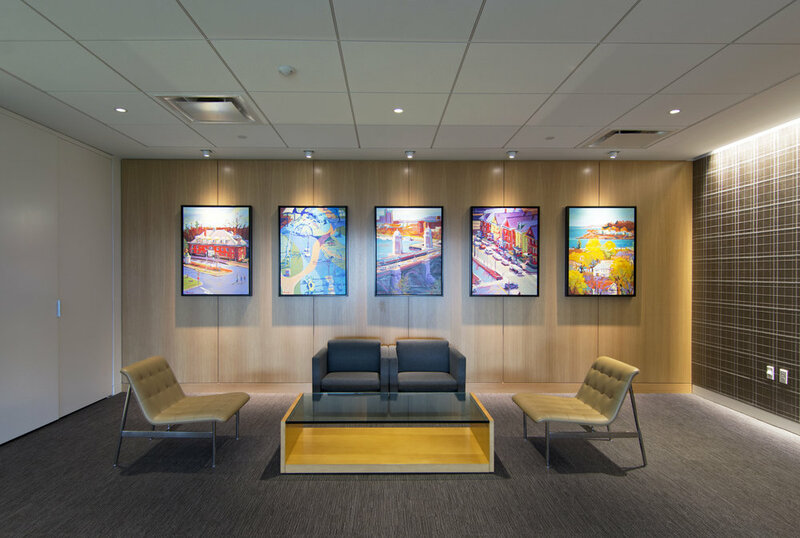 Seen below, an artist’s suite of five paintings capture the unique urban and landscape views seen by patients at five different hospitals or rehabilitation centers. To create these works, the Providence-based artist visited a number of patient rooms and waiting areas, as well as viewed social media posts from patients documenting the world outside the hospitals’ walls. The pieces, among others in the building, help reinforce how connected the patients and caregivers are to the local communities and reinforce the idea that Partners is committed to understanding the patient’s perspective. The Somerville campus brought together employees and departments that had formerly been located in 15 offices across Eastern Massachusetts. With the goal of creating an atmosphere that reflected Partners’ dedication to their four mission pillars: community, patient care, research, and education and teaching, Boston Art worked closely with the design team, the Diversity Council, and a number of the organization’s leaders to devise a clear Art Program Mission. 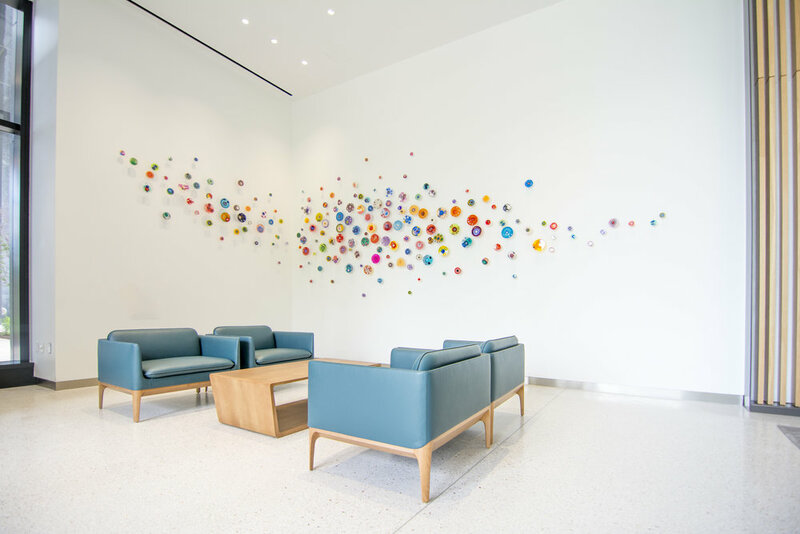 People & Places is a permanent exhibition of original artworks highlighting the global communities and cultures Partners HealthCare serves, as well as the communities and cultures that make up the Partners workforce of several thousand employees. Alternating with the local photographic collage floors, each central hub corridor is dedicated to a particular continent and includes works by artists or contains themes from its representative continent. Echoing Partners’ commitment to diversity and inclusion, People & Places encourages dialogue, promotes diverse artistic styles and stories, and grounds Partners’ everyday work in local and global communities. Boston Art researched countless local and international artists to find the ones that spoke most strongly to their community’s culture.